Russert best known as host of NBC's "Meet the Press"
(CNN) -- Tim Russert, who became one of America's leading political journalists as the host of NBC's "Meet the Press," died Friday, the network said. He was 58. Tim Russert established himself as the face of NBC's political journalism as host of "Meet the Press." The network said the award-winning journalist collapsed at work Friday. He was taken to Washington's Sibley Memorial Hospital, where he died, the hospital confirmed. Colleague and former NBC anchor Tom Brokaw broke the news on the network Friday shortly after 3:40 p.m.
Russert had just returned from a family vacation in Italy with his wife, journalist Maureen Orth, and son, Luke, to celebrate his graduation from Boston College, Brokaw said. "I think I can invoke personal privilege and say this news division will not be the same without his strong, clear voice," Brokaw said Friday. Russert was born May 7, 1950, in Buffalo, New York. His parents were Timothy John Russert Sr., or "Big Russ," a newspaper truck driver and sanitation worker, and Elizabeth Russert. Buffalo Mayor Byron W. Brown ordered that all flags on city property be lowered immediately to half-staff in Russert's honor. Before joining NBC, Russert served as press secretary for former New York Gov. Mario Cuomo and as chief of staff to Sen. Daniel Patrick Moynihan. Russert joined the network in 1984 and quickly established himself as the face of the network's political coverage, eventually becoming senior vice president and Washington bureau chief of NBC news. His career at NBC was marked by a number of milestones. In 1985, Russert supervised live broadcasts of the "Today" show from Rome, Italy, negotiating an appearance by Pope John Paul II -- a first for American television. He was also the recipient of numerous awards for his work, including an Emmy in 2005 for his coverage of the funeral of President Ronald Reagan. "Tim was a true child of Buffalo and the blue-collar roots from which he was raised," Brokaw said Friday. "For all his success, he was always in touch with the ethos of that community." "If you come from Buffalo, everything else is easy. Walking backwards to school, for a mile in the snow, grounds you for life," Russert told the Washington Post's Howard Kurtz in 2004. "Plus, if you have a family the way I do, it's a daily reality check." Russert, who also served as a political analyst for cable network MSNBC, took the helm of "Meet the Press" in 1991, turning the long-running Sunday-morning interview program into the most-watched show of its kind in the United States. During his 17-year run as the host of "Meet the Press," the longest of any host in the show's 60-year history, Russert earned the respect and admiration of many journalists and politicians. "He was an institution in both news and politics for more than two decades. Tim was a tough and hardworking newsman. He was always well-informed and thorough in his interviews. And he was as gregarious off the set as he was prepared on it," President Bush said Friday. His professionalism earned him many accolades. The Washingtonian Magazine once dubbed Russert the best and most influential journalist in Washington, describing "Meet the Press" as "the most interesting and important hour on television." 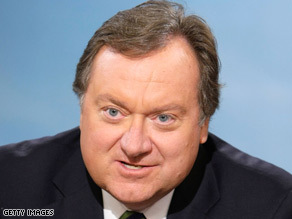 Brokaw described Russert as a political junkie who threw himself into his work during this year's presidential contest. "This was one of the most important years of Tim's life for many reasons," Brokaw said. "He loved this political campaign. He worked himself to the point of exhaustion many weeks."